GYG series thermosetting plastic injection molding machine is suitable for producing thermosetting plastic wares with high precision. The machines enjoy advantages from other machines, with advanced design, high efficiency, low power consumption, low noise. Several kinds of hydraulic, electric control system are available for the buyers to choose. Screw with optimum design enjoys features of good plasticity, high efficiency. Big L/D ratio of plasticizing screw. Decompression device to prevent nozzle from drooling. Return rotary device for the convenience of screw disassembling and cleaning. Heated by medium so the temperature is accurately controlled. Optimize designed five fulcrums and double inclined toggles clamping unit has functions such as big force enlarge rate, high speed, placid movement and large mold-open distance. Having hard chromed on the surface, the tie bars is corrosion-resistant and wear resistant. Mechanical and hydraulic eject device with one time or multiple eject function. Hydraulic motor driven mold adjustment accelerates mold changing process. With reliable mechanical, electrical safety device. Introducing double-pump power circuit to save energy. Low pressure mold clamping device and mold protection device. 24 volt DC control circuit. Introducing imported oil sealing, limited switches, solenoid valves etc. makes machine more reliable. Following option types are available with different electric, hydraulic control system to meet the users' requirement. I type: Northman valves, 24 volt dc relay circuit control. II type: Northman direction valves, Northman proportion pressure valve, thembwheel valves, thembwheel voltage adjustment, 24 volt DC relay circuit control. III type: Northman direction valve, Northman P-Q valve, or Vickers P-Q valve, DCS-220 series computer control. IIIA type: Vickers direction valve, Vickers P-Q valve, transducer, MJ-5000 series computer control. 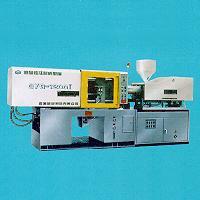 Please consult our sales company for details requirement on the machine.